Lily Verlaine has just returned from Las Vegas. I expect her to be weary, worn out by her whirlwind schedule of the past month. Far from it. Her voice sparkles like a 1995 Veuve Clicquot La Grande Dame Rosé. She talks with me about all sorts of things: what gives her inspiration, meeting the legends of burlesque at the Burlesque Hall of Fame, Seattle and its dance community, and supporting her friends while in Vegas. She talks with me about everything–except herself. Such a humility is quite rare among performers. But Ms. Verlaine is no ordinary performer. Best known for her productions of Land of Sweets: The Burlesque Nutcracker and Through the Looking Glass: The Burlesque Alice in Wonderland, Ms. Verlaine is an accomplished ballet dancer who found her way into burlesque a little over ten years ago. 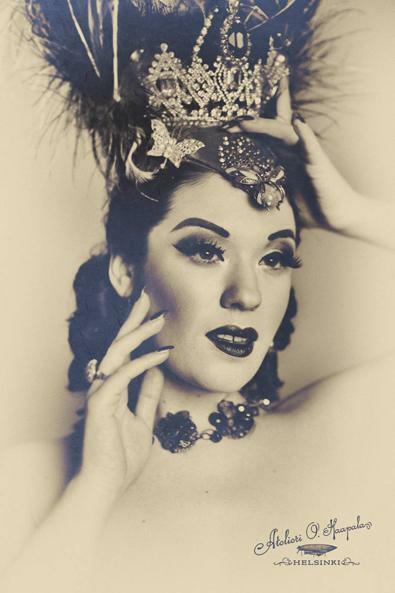 Since then she has become one of the brightest stars in burlesque, a true historian of the form and, perhaps even more importantly, a tireless promoter of others in the field. Saturday night Ms. Verlaine revives her long-dormant show, Nightcap, at The Triple Door. Unlike her longer thematic shows, Nightcap is, as she says, “a late-night, mingly kind of meet-and-greet” at a much more casual tempo. “It’s kind of a short and sweet show, a revue. I think of it as more of an event than a show,” she tells me. Despite its casual nature, Nightcap nevertheless features extraordinary talents on the stage and off. Ms. Verlaine’s regular partner Jasper McCann will host. The fabulous boylesque mister(ess) Waxie Moon will be performing his “Air to the G String” routine while Paris Original brings back his “Peacock Phoenix” to please the boylesque fans’ palettes. The 2013 Kansas City Burlesque Festival Queen, Iva Handfull, has prepared a brand new act for just the occasion, and Sara Sparrow a new trapeze and corde lisse act for fans of nouveau cirque. And not content with that, Ms. Verlaine has tapped the talents of the 2013 winner for Best Debut at the Burlesque Hall of Fame, Miss Lada Redstar, who comes to Seattle for the very first time all the way from Sarajevo via Paris and Berlin. Internationally renowned, Lada Redstar has, to my knowledge, never performed in the United States outside of Las Vegas, so this is truly a rare treat. Off-stage, America’s #1 cocktail bar owner, Ben Dougherty, is mixing up a special signature drink for the evening, rumored to be something with exotic with bourbon and apricot brandy. “Exactly the sort of thing you want to drink before you go to bed,” Ms. Verlaine assures me. There is also a rumor that Ms. Verlaine herself will reprise her bathtub act that rocked the Moisture Festival two years ago. I do not press the issue, but I can hear the smile in her voice. I admire her spirit and I think her ideas are good for Seattle. Not just for people already involved with burlesque, but others as well. As she explains it to me, I note that Nightcap has the potential to draw in diverse crowds. It requires not too much imagination to see that it can easily overlap with stand-up comedy, aerial dance, magic arts and even improv. With a little more support, many things would become possible. “I’m really hoping this event generates enough interest so that I can keep doing this regularly there,” says Ms. Verlaine. “I honestly love wearing the producer hat,” she says. 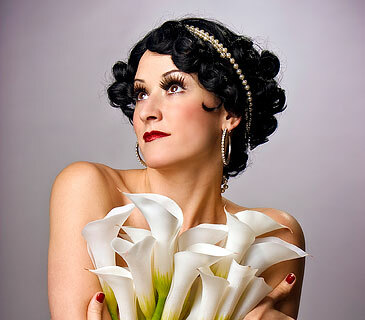 Lily Verlaine: producer. It has a good ring, I tell her. Sometimes it is nice to promote others and not have to worry about one’s own work. She agrees. “I like to support people. Community is important.” Compared to the dancers of the past, the modern burlesque dancer has so many options that it often becomes overwhelming when choosing. But this, she reminds me, is a privilege. Not merely charmed, also extremely charming, I reply. She is a lovely woman, passionately dedicated to her craft but also to the community that makes her craft possible. “I’m here to help other people,” she says. I can only wish that many people help her in return. Very few people in Seattle’s arts community are so full of care and sacrifice without concern for a little kitu kidogo or without wishing to build a private fiefdom. Lily Verlaine is not one of them. She is, in the truest sense, a dedicated artist and a wonderful human being. I can only wait hopefully for the next thing she brings to Seattle.